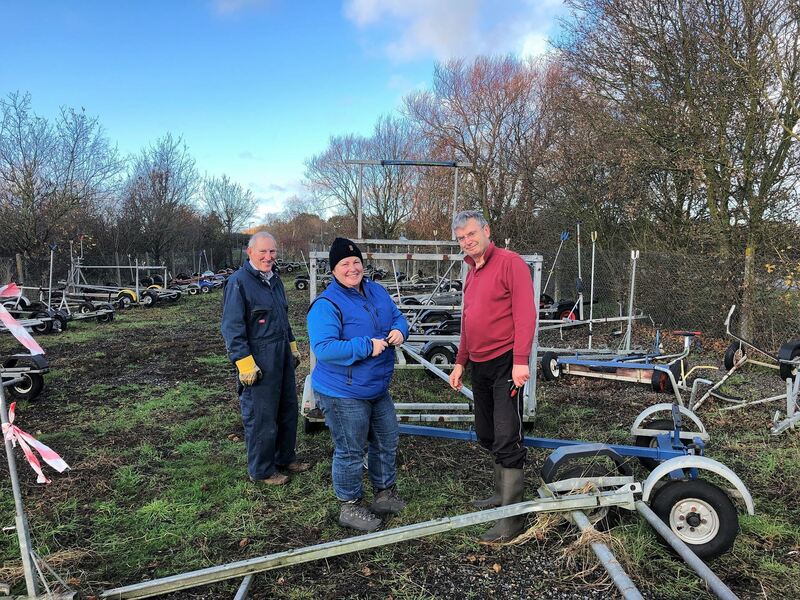 On Sunday 2nd December a record number of more than 35 members turned up to help at our second winter work party. The overnight rain cleared over to leave a pleasant and dry day which enabled us to get lots done. 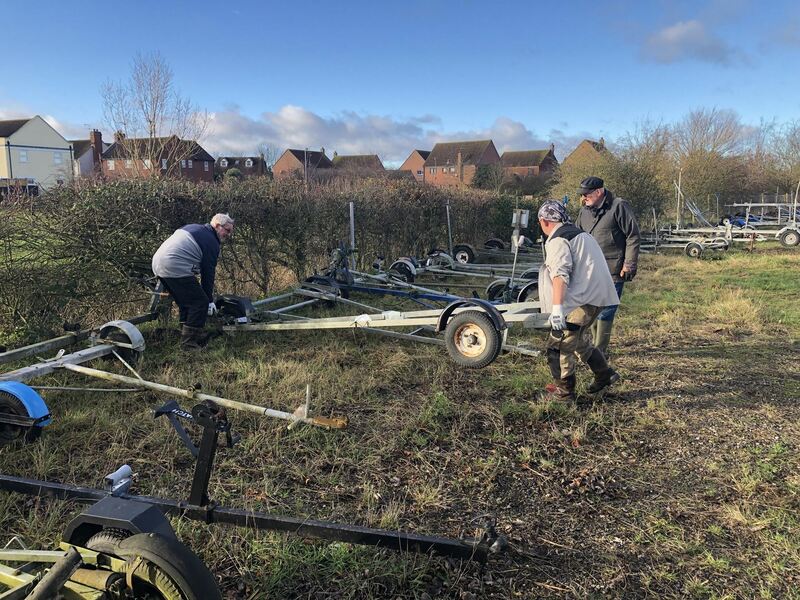 Repairs to the ramp were completed, tree stumps pulled out, brambles removed, sheds cleared out and the dinghy trailer part was emptied, strimmed, reorganised and left beautifully tidy. A number of trailers which appeared redundant or abandoned were dragged from the undergrowth and put by the fence to the left of the double gates as you enter the site by footpath. Please would members check if theirs is among them – if not claimed, they will be disposed of or offered to a museum in the new year. A big thank you to Julie for organising us all and to Kathryn and her team in the galley for keeping us fed and watered. There was a happy, friendly atmosphere at the club as everyone worked together to get so much done. Thank you to all those who gave up their Sunday and came along to help. 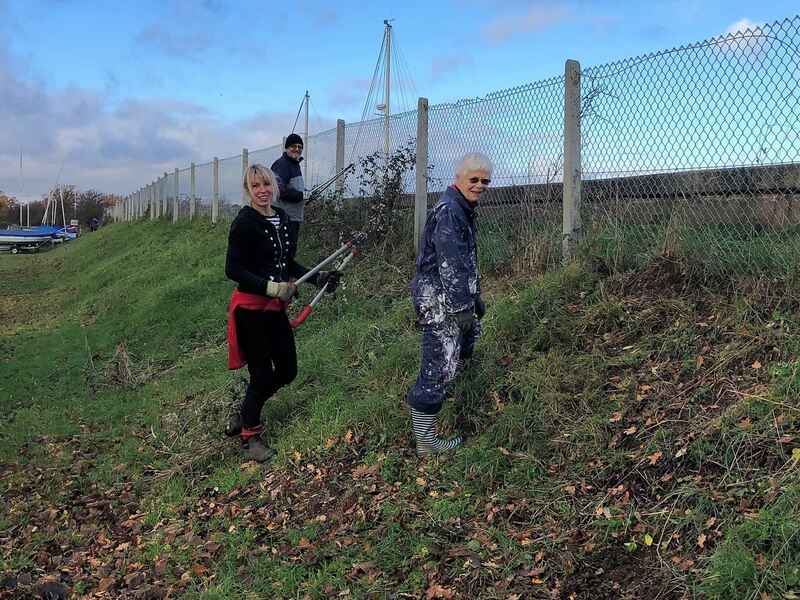 Our next work party is on Sunday 13th January. Put it in your diary now – what a great way to work off those excesses over Christmas. Laying Up Supper - The Lion House Rocks! On Saturday 17th November 110 members and their guests packed into the Lion House function suite at the Lion Inn, Boreham for our first black-tie Laying up Supper for four years. Everyone looked very smart in their finery and there was a great atmosphere as guests arrived and enjoyed a pre-dinner drink. After a nautical grace from the Rear Commodore, everyone settled down to enjoy a delicious three course meal with friendly and efficient service from the house. During coffee, the Muhlhauser Trophy was presented to Sir Julian Berney Bt. for his log of cruises to and around the Canaries. Julian then gave a short talk about the significance of George Muhlhauser and his yacht ‘Amaryllis’ which we fortunate to have a model of at the club. After this, the raffle was drawn. Thanks to the generosity of members, we had some amazing prizes which were divided into five goodie bags for the winners. Without further ado, DJ John entertained us with his mix of music and the dance floor was quickly full of people showing off their moves. The Friday Sailors were obviously having “The Time of their Life” and after an impressive attempt to drink the bar dry sampling every shot in the house, they took to the floor. Sadly, their attempt to recreate the iconic lift from ‘Dirty Dancing’ didn’t quite come off. Not to be deterred, they dragged everyone still sitting to their feet and formed probably the longest conga ever seen at the Lion House. This wound its way around the premises for some time and then the dancing continued late into the night. All in all, a great time was had by all and evidence that there is still demand for a black-tie annual event if the venue is right. Many thanks to The Lion House and to Sue Sheppard and her team for organising a most enjoyable event. We are proud to support the Royal British Legion 2018 poppy appeal to commemorate the centenary of the end of the First World war. Local RBL supporter Shaun Morgan has stationed 'George' the WW1 Silhouette Sailor at the entrance to the club and Heybridge Basin to help raise awareness for the RBL centenary poppy appeal. Shaun served as Lance Cpl 103/104Bn REME until he was medically discharged from the British Army with spine injuries. It is particularly fitting that his son who is in the Royal Signals, put our RBL statue in place. The club was well established with a membership of over 100 when war broke out in 1914. At this time, many members volunteered for active service and some were never to return. During this period of Remembrance, please remember all those who served, sacrificed and changed our world. In particular, please join us in saying ‘Thank you’ to all those from Maldon, Heybridge and the sailing community on the river Blackwater who gave so much. We hope you will give your generous support to the 2018 Poppy Appeal. On Thursday 18th October 53 members sat down to enjoy a delicious lunch in celebration of Horatio Lord Nelson’s famous victory at Cape Trafalgar in 1805. Don Baines introduced the proceedings and following the Trafalgar Grace by the Rear Commodore, diners enjoyed a broadside of beef with mushrooms in red wine, Emma’s Yorkshire puddings, creamy mash, cheesy leaks, carrots and peas. This was followed by Trafalgar jam roly poly pudding with custard. The Commodore then gave an entertaining talk about the colourful life of Emma, Lady Hamilton before she met Horatio in Naples in 1793 and the powerful bond that developed between the two after they first met. Former Commodore, Anthony Sinclair, proposed the toast to the Immortal memory of Horatio Lord Nelson, and to all those who fell with him and guests then “Spliced the Mainbrace!” with Lady Hamilton’s nip – a tot of spiced rum. Tea, coffee and slow matches followed to round off what was a most enjoyable occasion. Many thanks to Marilyn Sinclair and her team for continuing to provide these popular lunches at the club. On Sunday 7th October a cool force 3-4 NNW wind and autumn sunshine greeted the 39 dinghies and cruisers competing in our last all in race of the season, the Dyer Cup. Race Officer George set a long line extending south from Osea Road and achieved a remarkably orderly start for the down wind broad reach port tack start. The committee boat end was very busy, but others opted for a clear wind start towards Osea. Spinnakers quickly appeared allowing the faster boats to pull clear of the closely bunched slower boats. A gybe around Doctor and then a close fetch to South Doubles and hard on the wind to Hilly Pool. Bear away for a run down to Nipper and a final gybe for the beat back to the club line. The first boat home was the Spitfire in 39 minutes but a brilliantly sailed race by Marnie and Ellie in their Feva gave them an impressive victory over some of the club’s finest helms. Second, and winning the Fendick Cup was Terry Crook in a blaze. This was a very closely contested race with only 4 minutes on corrected time between the first 21 boats. This wasn’t a day for the cruisers though, first home was Joe Leary and Breezy in 30th place overall but winning the Copsey Cup for first cruiser. A short Dyer cup course was set for younger cadets in toppers and optimists. It was particularly fitting that the prizes were presented by 90 year old Peter Wilson, our oldest honorary cadet member who had made a special trip to the club for this event. Over the weekend 29-30 September a hardy bunch of BSC Cadets took part in the British Youth Sailing Regional Championship at Grafham Water. This was a six race open event over two days, with classes for Optimists, Toppers, Teras, Fevas, Cadets and Laser 4.7s and regatta fleets for the Optimist, Tera and Topper. Conditions were good over the weekend with a shifty F2-3 breeze on the first day which made some of the races a bit of a lottery, on the Sunday the conditions were better with a steady F3-4 for the racing. BSC had a total of 12 sailors at the event, the biggest fleet was in the Optimist Championship Class where Nick Evans had a superb event winning the class with two Bullets, two seconds, a third and a fourth place. Further down the fleet Hugh Andrews had a successful campaign finishing 10th overall and registering a bullet. Jess Haigh, Lucy Shelter, Dominic Carver and Osea Evans all had very good results and hopefully have all done enough to qualify for the RYA East Zone Squad. In the Topper Championship fleet club stalwarts Lloyd and Jessica Taylor showed a strong performance, Lloyd finishing eighth overall with one second place. Ben Haigh competing in his first Laser open event performed very well in what effectively was a national event finishing 63rd out of 67 racers. In the Optimist Regatta fleet Charlie Bourne had an exceptional weekend winning the event with two Bullets along the way. Hector Trickey in the RS Tera Regatta fleet had a good weekend finishing second overall. The RYA Onboard Fun Fleet was a welcome addition this year and gave cadets who are not quite ready for racing the chance to improve their sailing skills, Katherine Carver had fun in this fleet and would recommend it for next year. Overall, this is a really good event and is the perfect opportunity for BSC sailors to start their sailing adventures outside the club. We hope to see more cadets there next year. For the attention of all cruiser owners with moorings. The following days have been arranged for you to come and recover your mooring buoy and swivel for the winter. I intend to have this as a team effort. 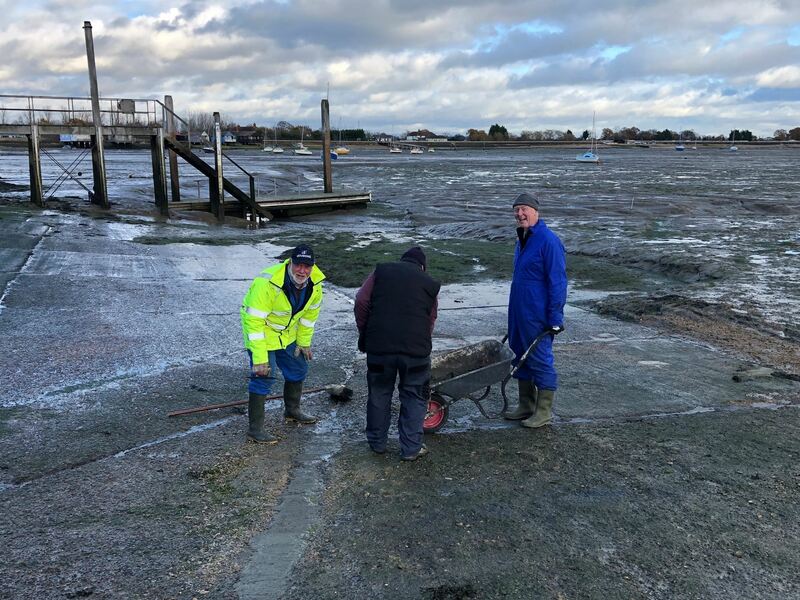 Fitter members can come out on the workboat to collect buoys and take them to the slipway, where others can then take them to the wash down to be power washed. If anyone isn't occupied it's tea and coffee duties! You will have to provide a winter marker buoy with your mooring number clearly marked, and 7 metres of suitable rope/light chain. If you can’t find your marker buoy, there are a lot in the container. This line must be thick enough and strong enough to lift your riser chain to the surface in the spring when it is all green and slimey! Please wear old clothing suitable for the weather, and a buoyancy aid or lifejacket if coming afloat. Please remember that if your buoy is left out over the winter, your mooring tackle is likely to have half the normal working life. No need to advise attendance, just turn up at a session start time. B.J.R.C. BART'S BASH RACES CANCELLED. Following discussions between the Blackwater clubs, the organisers have decided to cancel the races scheduled for Sunday 23rd September. The forecast is still uncertain, but it seems a deepening low pressure is going to track right over us. While the winds may be deceptively light in the morning, they are likely to build rapidly from lunchtime with heavy rain and strong gusts. It was not felt to be sensible to have a large fleet of boats scattered around the Blackwater when this happens. Sorry for any disappointment, lets hope we can try again next year.